My FI and I wanted to incorporate traditions into our ceremony. Since he is Scottish, we have decided to do a handfasting during the ceremony. Ever wondered where the term "Tie the Knot" came from? Handfasting! The very word Handfasting derived its origin from the wedding custom of tying or hitching the bride and groom's hands or actually their wrists together, as a symbol to their clan, tribe or village of their decision to be bound together in family living. The traditional length of time was a year and a day, or 13 moon cycles. If the marriage proved to last over this period of time, then the vows would be renewed for a life time or they renewed them for "as long as love shall last". My fiance and I will agree to a set of commitments and then our hands will be fasted with the Cunningham tartan. 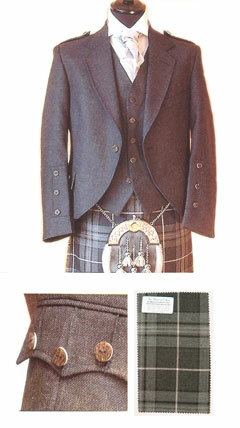 We considered the idea of having him wear a kilt. Instead, he is going to buy a tux. It seems much more practical to buy a piece of formal wear that he can rewear. Has anyone ever seen a Scottish handfasting ceremony? I have not but am excited to participate in the tradition. We are looking forward to doing this in our wedding as well. I'm trying to find the specifics on handfasting so we can incorporate it as well- I'm having a hard time finding a "how to" on the procedure... suggestions? If you want a copy of our handfasting ceremony, email me at misse at honeybeeweddings.com. Thank you very much for e-mailing me the ceremony. Even in translation it worked beautifully.